Westbrook senior Nyagoa Bayak is no stranger to success at the New England Indoor Track & Field Championship. Saturday she will attempt to win her third New England title in the high jump, she took her first title as a freshman, and won again last year clearing a meet record tying 5-10. The LSU bound Bayak has been terrific in the championship season so far clearing 5-10 1/2, 5-11 & 6-0 in her last three meets. 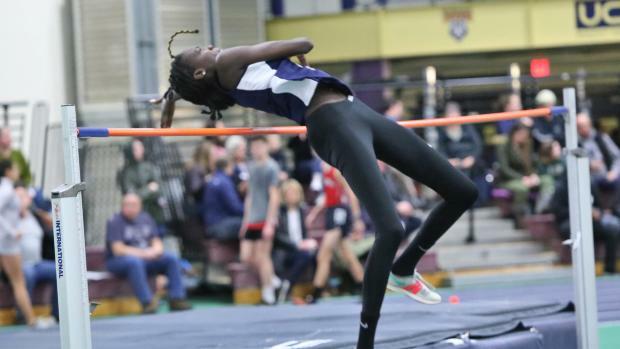 At the Class A state meet two weeks ago she cleared the elusive 6 foot barrier for the first time, breaking the New England all-time best in the process and a jump that currently ranks her tied for second best in the US. "The goal is to be consistent, clear 6ft again." Bayak said of her goals for Saturday. "If I clear higher than 6 than great." 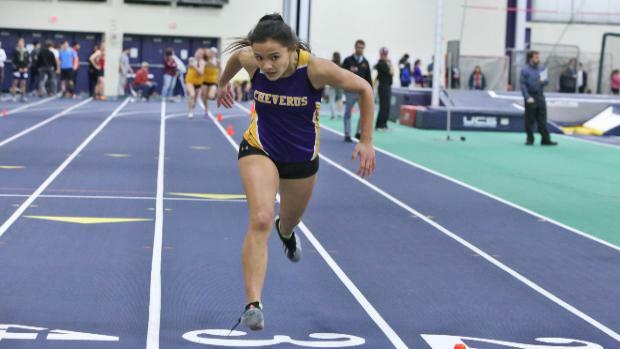 Cheverus sprint standout Victoria Bossong fresh off a new state all-time best in the 400m on Sunday at the BU Last Chance meet enters as the second seed in the 300m. Bossong sets a Maine best in the event of 40.16 when she won the Dartmouth Relays in early January. At the Class A State meet Bossong set three state meet records en route to sweeping the 55m, 200m & 400m, leading her Stags to the team title for the second year in a row. The 300m might be the perfect racing distance for the speedy Bossong who has a 200m best of 25.43 on a flat track, and 55.66 400m best. In the hurdles Class A state champion Emily Labbe of Scarborough is looking to make the podium for the second straight season, a year ago the junior finished 6th place running 8.58. She enters this year with a time of 8.44 from the state meet which has her ranked fourth. She was hobbled with hamstring tightness two weeks ago but is feeling much better heading into Saturday. Cape Elizabeth's Darcy Cochran won the Class B state title in the 55m hurdles in the third fastest time in state history a 8.41 that has her seeded second based on times run at the state meet this season. A year ago she finished 11th in 55m hurdles at New Englands and didn't make the final but came on strong during outdoor were she was third in both the 100m & 300m hurdles. Scarborough's Madison Marinko is seeded 10th in the 55m hurdles, she is coming off a personal best 8.61 which was fast enough for the Class A runner-up. The long jump should be a strong event for Maine as Class B state champion Camille Kohtala is seeded third with her winning mark of 18-4 3/4. Kohtala would earlier this winter jumped 19-4 has what it takes to win the event as the top seed comes in with a best of 18-6 3/4. She finished fourth a year ago earning All-New England honors. Class B runner-up Cymeria Robshaw of Penquis is the fourth seed with her mark of 18-3 3/4. 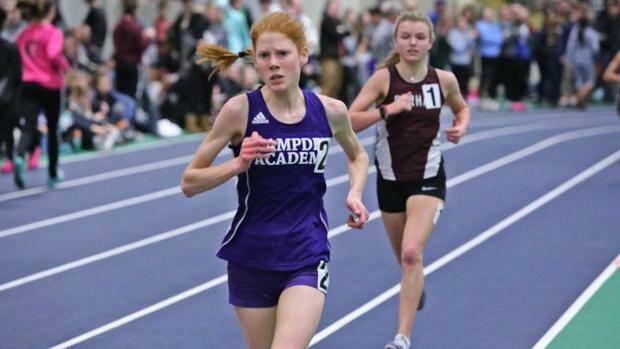 Helen Shearer the Class A two mile state champion from Hampden Academy had a breakthrough race two weeks ago winning her first individual state championship indoors. Shearer's time of 11:06.09 qualified her for the emerging elite race at Nationals, and moved her to eight fastest performer in state history. A sub 11 run is in the cards, and she would join an elite group of 5 who have done so in state history if she can accomplish that on Saturday. Edward Little's Jillian Richardson is a top ten seed in the mile, the Class A state champion ran a personal best 5:10.66 two weeks, and will be looking to run well under the 5:10 barrier. The Marshwood 4x200 relay of Cici Perodin, Carmie Kriz, Katherin Page & Rori Coomey ran 1:48.35 at Class A states moving them to fourth fastest team in state history. The banked track of the Reggie Lewis Center can be advantageous as the evidenced by the state all time best of 1:46.89 run by Cheverus two years ago. Speaking of relays the Bonny Eagle Scots are ranked 10th in the 4x800m relay, the Class A winning team of Kayla Raymond, Hanna Stevens, Gretchen Beigel, & Ami Beaumier ran 9:46.25, a sub 9:40 is well within reach for this squad and if they do crack that barrier they would moved up to third fastest in state history in the event.